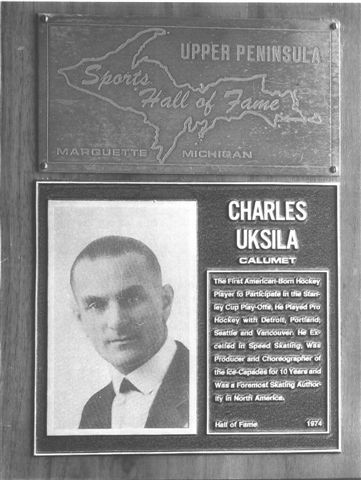 Charles Uksila, born in Calumet (1887-1964) was the first American born hockey player to participate in the Stanley Cup playoffs, while playing for the Portland, Oregon 1915-16 PCHL team. Charles played hockey locally with the CLK teams from 1907-1911. 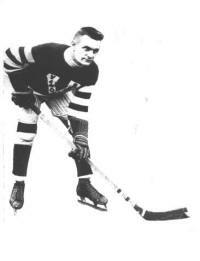 He then played pro hockey with Detroit, Portland, Seattle and Vancouver from 1913-1920. As a youth, he was a player on both the 1910 and 1911 local Mohawk senior teams which won the Copper Country Senior Championship in those two years. In 1915-16 and 1917-18 he played with the Portland Rosebuds (the Rosebuds later moved to Chicago to become the Blackhawks) including the 1916 Pacific Coast HA All Stars games. In 1918-19, Charlie played with the Vancouver Millionaires in the Pacific Coast Hockey League with Cyclone Taylor who had played here 2 seasons on the Portage Lake team (1905 & 06). On March 17, 1916, the Portland, Oregon PCHL team made up of 9 players including Uksila, stopped off here in Houghton to play an exhibition game in the Amphidrome against a team of Northern Michigan All Stars. The game ended in a 6-7 loss for the local All Stars. The Portland team left that night for Canada where they played a series of games against Montreal for the Stanley Cup; making Charles Uksila the first American born hockey player to participate in the Stanley Cup playoffs. Charles later excelled in speed skating and skate dancing all across the Western United States and Canada. There were 14 children in the Uksila family, many of Charles siblings were performers. Charles and his sister, Lenna (Lena) Uksila (1895-1956), appeared in solo and duo acts throughout the US and abroad. They had a contract for 14 weeks in Australia in 1923, where they performed; part of the contract was for Charles to coach a hockey team. After his sister married in Australia, Charles teamed with his wife, Dorothy Blunt Uksila aka Vida (1899-1961), in figure skating acts, appearing at fairs and in night clubs on indoor ice rinks called "tanks". During that time, Charles also refereed National Hockey League games. 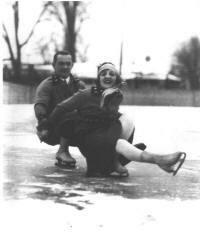 Brother Robert Uksila (born 1902) was also a hockey player then he became a performing skate dancer with his wife Gretel. Charles was one of the skating sensations that opened the first ever performance at the new Palais de Glace in Hollywood opening on February 10, 1925 on Melrose Avenue at Vermont Avenue, and attended by "thousands of ardent devotees in gala attire" who turned out for the first ice rink in Southern California.... After some speeches, there were performances by "Miss Margot," who did her "dizzy gyrations," Harley Davidson, Jack Fusick, Hazel Deane, George Brian, Carolyn Trask, Charlie Uksila, Robert Mann and Emily Brown, "all expert exponents of the art of ice skating...."
Photos courtesy of Dana Uksila Waters. Upper Peninsula Sports Hall of Fame in 1974. Charles would put on Sunday afternoon matinee performances at the Mohawk Glaciadom; old-timers remembered Uksila barrel-leaping on his ice skates. "He put on a good show with his long bladed skates. The kids called them racing skates; they always added "but they ain't no good for hockey tho!!" Another story of this "dare devil" said he drew quite a crowd as they watched him do head stands on one of the highest local mine shafts. 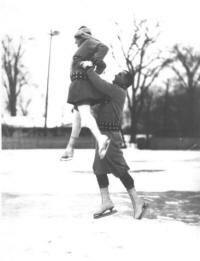 Charles and his wife, Dorothy, aka "Vida" traveled all over performing on skates, they were in the Chicago World's Fair in 1933-34 and traveled with the world famous Norwegian figure skater, Sonja Henie. 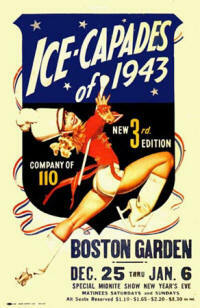 After his athletic career came to an end, he was the producer and choreographer of the famed Ice Capades for 10 years. Robert Uksila, born 1902? 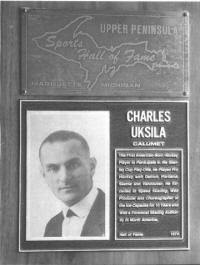 in Calumet (or 1898-1972) played hockey for... later Robert and his wife Gretle were professional skate dancers like his brother and sister-in-law, Charles & Vida Uksila. ... need info and pictures here! Mike Usitalo, born 1952 in Calumet, he played High School sports at Calumet, as a graduating Senior at Calumet High School, he was chosen for the George Gipp Award (The famous athlete, George Gipp, grew up in nearby Laurium.) While in High School, he played hockey for the CLK Wolverines at the age of 16. Mike then played at Michigan Tech University (1970-1974). 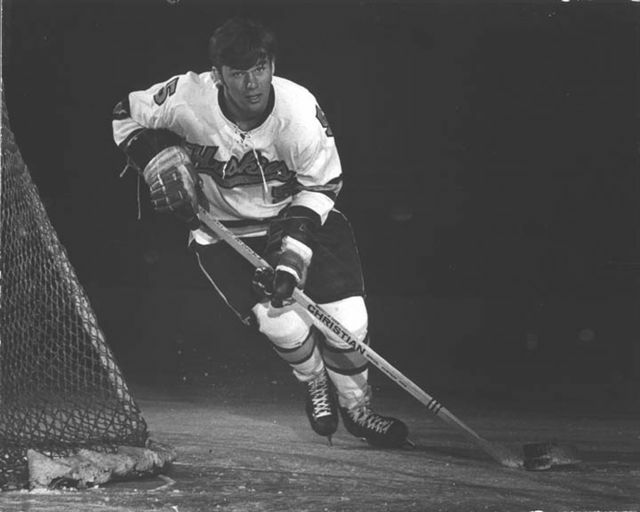 He had a WCHA-record 28 goals as a freshman in 1970-71, had 71 total goals in 61 games for the Huskies, and was drafted by the NHL's Los Angeles Kings in 1972: 6th round, #84 overall. He helped the U.S. team win the World Championship in 1974 in Yugoslavia and was rookie of the year in the American Hockey League in 1974-75. 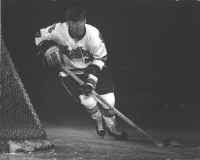 From 1974-76, he played hockey teams with the Springfield Indians AHL, Muskegon Mohawks IHL, and Fort Worth Texans CHL. An injury in the 1976-77 season ended his hockey career. 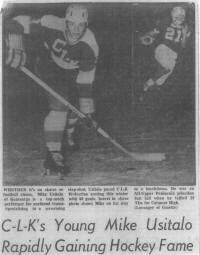 Mike was inducted into the Upper Peninsula Sports Hall of Fame in 2001.